MI Road, short for Mirza Ismail Road, in Jaipur, Rajasthan, India, is a wonderful place to start exploring all that the glorious ‘Pink City’ has to offer. In fact, it is said that the roads in Jaipur were designed to eventually lead you to this very street in the heart of the city. 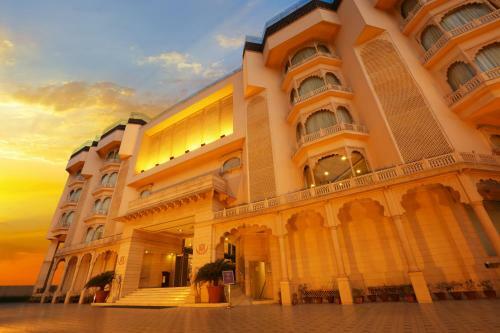 Not only are you just 2 km (1.24 miles) from the Jaipur Bus and Train Station, but you will discover many restaurants, famous landmarks (Birla Auditorium, Ram Niwas Gardens, Hawa Mahal) and one of the most vibrant shopping areas close by. With this being said, it is highly recommended that you plan your stay at the Leisure Inn Grand Chanakya, a 52-room hotel, located on the very happening MI Road. Here are some reasons why. At first glimpse, you may not realize how luxurious this hotel is. However, once you’ve stepped inside, you will appreciate the warm environment. There is a beautiful fountain with Lord Ganesha, also known as Lord Ganesh, a cherished Hindu deity known as the remover of obstacles, which radiates with a serene and calming energy. There are comfortable couches where you can relax and take it easy from your long journey, before or after you check-in. A bellboy will soon help you with your belongings, and gladly show you to your new home away from home. Despite it being a 3-star hotel, you will appreciate how clean and sizable the rooms are. There is also an alternative space to do work, read, or enjoy a meal from the 24-hour room service menu. Aside from having high quality bedding, all rooms are provided with an in-room electronic safe, air conditioning, a coffee/tea maker, a mini-bar, a 32" LCD TV, and of course, a fast Wi-Fi connection. The bathrooms are private and you will have access to hot water 24 hours a day. There is a spacious shower, instead of a bathtub, and you are provided with all the essential toiletries. If you make a quick call to the reception desk, you will be brought a hair dryer, extra towels or toiletries if needed, as well as an iron and ironing board. 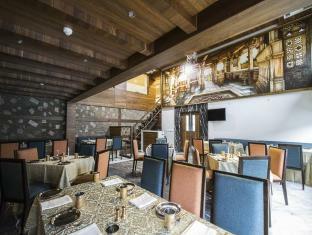 Once you are settled into your room, there are many dining options to choose from, such as the Grand Chanakya, open from 12:30pm – 10:30pm, and well-known for its authentic vegetarian Rajasthani dishes along with other delicious Indian cuisine. If you have a carnivorous appetite, or are looking to have a drink, you will want to visit Arya Bar & Grill located on the hotel’s rooftop; open from 7pm until 11pm. 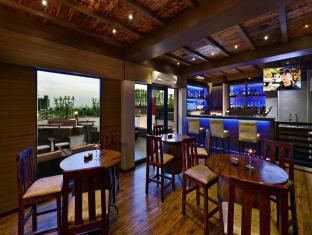 You will be able to choose from succulent grilled meats that pair well with the wide selection of red and white wines. There is also Café Viva, located on the ground floor and open 24 hours a day. This café has a lovely breakfast buffet spread starting from 7am until 10:30am, available for a surcharge of 400 INR, or 5.93 USD per person, including Continental, American, and Indian varieties. For lunch or dinner you can enjoy a cocktail at the indoor bar while feasting on an array of Indian, Chinese, Thai, and Italian bites. I highly recommend the vegetable biryani (an aromatic rice dish that can be made with meat or vegetables, along with numerous spices) with warm chili garlic naan (freshly oven-baked flat bread). With so many available options to choose from, the hotel’s restaurants are sure to please even the choosiest of eaters. Room prices are very reasonable, considering the convenience of the location, and you have three options to choose from: a standard room with a king bed, the Leisure Inn room with twin beds or a king bed, and the Grand Chanakya suite with a king bed. Prices vary from 2099 INR (31.34 USD) climbing all the way to 7599 INR (113.46 USD). There are also many specials and packages available through the Leisure Inn’s website. Aside from the cozy rooms, and adequate dining possibilities, you will also find other facilities here, including a business center, a gym, laundry facilities, and a spa that provides excellent massages. Please keep in mind that check in starts at 2pm while your check out time is at 12 noon. The Leisure Inn Grand Chanakya is operated by the StayWell Hospitality Group, and you will earn rewards if you are already a member. If not, it is highly encouraged that you sign up to be a program member, though you will only receive points if you book your stay directly with the hotel.